As many of us who carry a cellphone already know there are many areas in the Eastern Townships that are "no signal" zones for analog and digital cellphone reception. How many of us have been driving down the 104, talking on the phone (yes it's actually dangerous to "yap and roll" but that's another story) and had the voice at the other end start sounding like a hollow submarine echo-fest before completely going dead...hello? Hello? Often business-people or labouring workers who are attempting to contact a client or the central dispatch find themselves near enough to a town like Knowlton, Sutton. Mansonville or Cowansville yet looking at their phone screens they see the dreaded "lack of bars" or "service not available" sign flashing! We need better cell phone reception and the ability to recieve and make calls. The fact that emergencies often require access to cellphones is enough of a reason to be appreciative that the Knowlton area will soon have a much needed cellular communications tower to provide service to the area. Good news that Knowlton is getting closer to "plugging in" as they begin this process of getting a new cellphone tower installed in the region as more and more, wireless technology and high-speed service are becoming essential to modern life and while there will certainly be some opposition to the placement of the tower there will likely be more people relieved that service has finally been extended to our region. 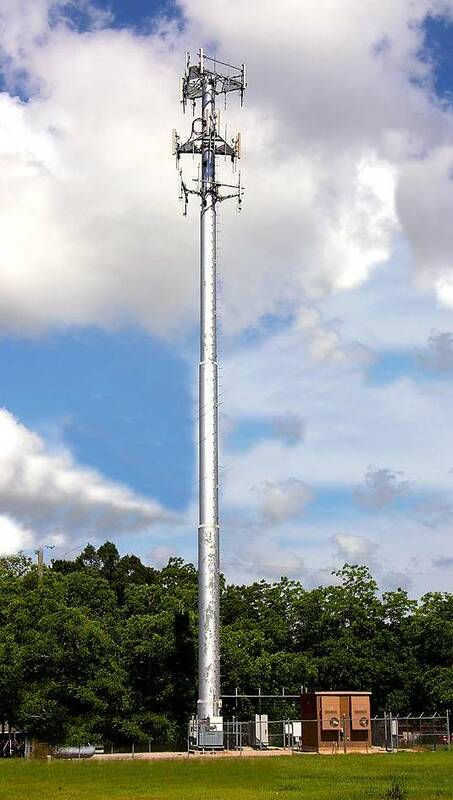 Public consultations are being held September 25th, 2006 at the Knowlton Legion at 7 pm regarding the installation of this cellular communications tower in the area. Spokespeople from communications companies, medical and scientific experts as well as Knowlton city officials are among those attending to discuss the project and answer concerns from citizens. All concerned should attend. 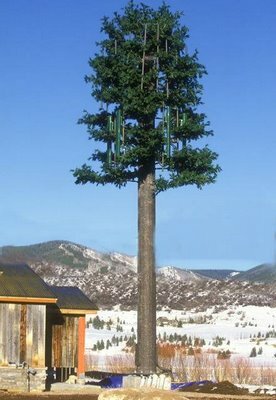 Some cellular companies and municipalities have gone through great lengths to disguise the towers making them look like trees, although these disguised cell towers often stand out like a police officer at a picnic! There are cell towers that look like enormous palm trees and some that look like incredibly huge pine trees and some cell phone towers are even dressed up as huge cactuses! The wirelessadvisor.com website features an entire gallery of cellphone tower pictures and some disguises. It will be interesting to see if we can come up with a disguise for our tower that best suits Knowlton! Debate surrounds the installation of cell phone towers as many people feel property values can be affected if the large towers are erected near their properties and similar evaluations in other areas show between a 3% and 10% drop in property values close to the towers. However, it should be noted that in rural areas, having such improved communications can become a factor in people deciding to live in a community which has a very positive impact. The same is likely in our area of Brome Lake. With the aesthetic questions and the concerns of safety of the radio frequencies and "radiation" emitted by these communication towers it is sure to be an interesting debate but in the end the ability to have improved, reliable communication and access to emergency help will be a welcome addition to Knowlton's peace of mind. Having such consistant ability to maintain a signal should be considered the priority over all issues. 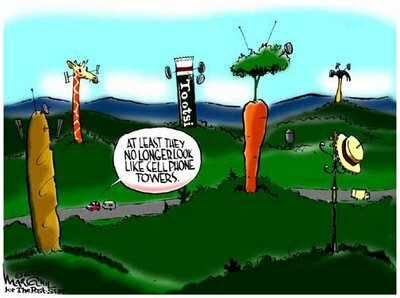 Of course, it is natural that residents will be worried about being part of the group that proved cell phone towers give off radiation that causes health problems. It is best to be informed on the realities of the issue before making up our minds. There is some pertinant reading that helps set the record straight that many people have with the myths and urban-legends about the dangers of cell phone towers on Mobile Phone (Cell Phone) Base Stations and Human Health on this website. More helpful reading from the Federal Communication Commission Information On Human Exposure To Radiofrequency Fields From Cellular and PCS Radio Transmitters from the FCC information on the subject. The reality is is that cellphones are an integral part of life now, and like it or not, it is crucial that we have un-interrupted access to a good signal, even heading down the shadey side of StageCoach Road!